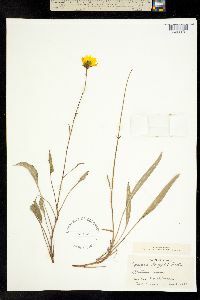 Perennials, 30-70 cm. Internodes (± mid stem) (1-)8-12+ cm. Leaves basal and cauline; usually alternate, sometimes opposite and alternate or all opposite; petioles 1-10(-15+) cm, not ciliate; blades elliptic or lanceolate to ± linear, (2-)4-8(-15+) cm × (3-)7-12(-40+) mm, sometimes with 1-2 lateral lobes. Peduncles (1-)4-8(-10+) cm. Calyculi of broadly deltate-ovate to lance-ovate or lance-linear bractlets 2-6+ mm. Phyllaries lance-ovate to lanceolate, 6-9(-12) mm. Ray laminae yellow, (12-)15-20+ mm. Disc florets 40-80+; corollas purplish or purple-tipped, 2.8-4.8 mm. Cypselae ± obovate to oblong, 3-4 mm, winged, wings 0.2-0.4+ mm wide, ± pectinate; pappi of 2 subulate scales 0.5-1+ mm. 2n = 26. 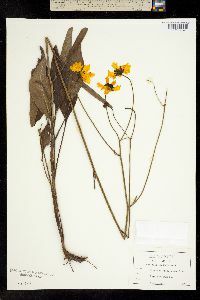 Flowering ± year round, mostly Sep-Oct. Peaty bogs, swamps, depressions, in pine barrens; 10-100+ m; Ala., Ark., Fla., Ga., La., Miss., N.C., S.C., Tex., Va. As here circumscribed, Coreopsis gladiata includes plants that others (without agreement among themselves) have treated as distinct species and/or varieties: C. falcata (leaves mostly basal and/or proximal, alternate, blades mostly lance-linear to linear, often 1-2 with 1-2 lateral lobes, faces not dotted; outer phyllaries lance-ovate to lance-linear; Ga., N.C., S.C.); C. floridana (leaves mostly basal and/or proximal, alternate, blades mostly lance-linear to linear, not lobed, not dotted; outer phyllaries broadly deltate-ovate; Fla.), C. helianthoides (leaves mostly cauline, alternate, blades mostly elliptic to lanceolate, not lobed, faces not dotted; outer phyllaries lance-ovate to lance-linear; Ala., Fla., Ga., La., Miss., N.C., S.C.), and C. linifolia (leaves basal and cauline or mostly cauline, alternate or opposite or both, blades mostly lance-linear to linear, seldom lobed, faces bearing dark or translucent dots; outer phyllaries lance-ovate to lance-linear; Ala., Fla., Ga., La., Miss., N.C., S.C., Tex., Va.).